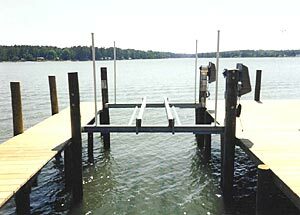 The low profile boat lift systems we manufacture were designed to eliminate the upper or overhead beams and allow for easy access on and off your vessel, which are only inches away from your pier. 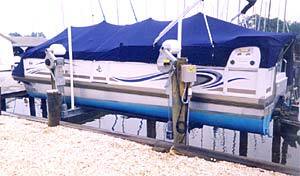 Drive units are mounted on the pier side for easier service, and there is no underwater wiring. 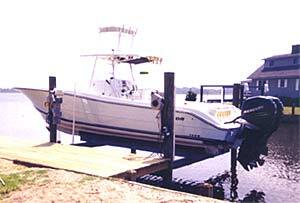 The two electric motor lift systems allows for easy leveling of boat, front to back. 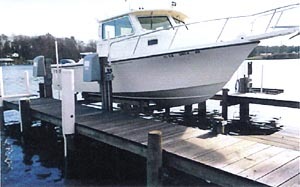 This is an aesthetically pleasing boat lift. 8,000 lbs. to 16,000 lbs. 120v/12.1a or 240v/6a motors available.